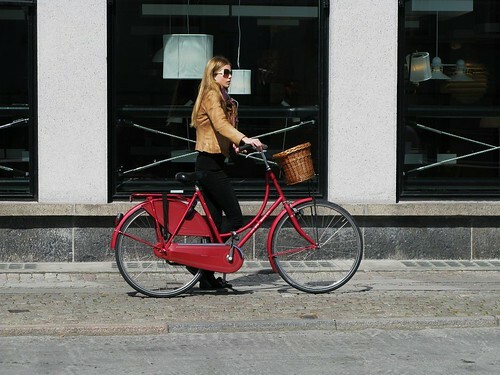 Red bikes are lovely in the sunlight. Classic Copenhagen. 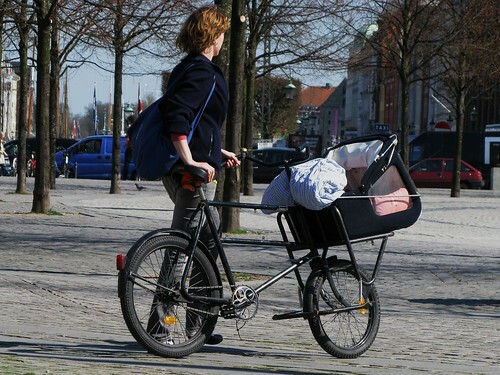 Newborn baby transported by bike. Red bikes are lovely in the sun.Green bikes are lovely on the grass. I like green its my favorite color you know. The red bike has a chain guard so your pant leg doesnt get caught in the chain?? Its funny after I noticed the chain guard it made me remember getting my own pant legs all chewed up and stuck in my bikes chain.haha It always pissed me off whenever it happened.haha Sometimes my ankle would get scraped up too,haha. Great memories. Your blog is cool! great pics - extra great are the supermum ones! WHERE CAN I BUY THIS FIRST ONE????? ITS THE MOST BEAUTIFUL IN THE WORLD I HAVE EVER SEEN!! 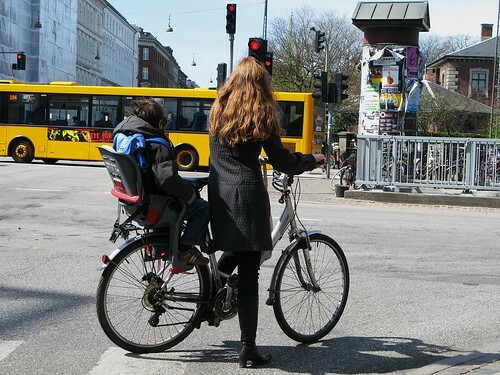 joearado: Almost every bike in Copenhagen has a chainguard. Every new bike on sale has one, as well as fenders, kickstand and, quite often, a skirtguard as standard gear. raquel: the bike is a Batavus 'Old Dutch'. See their website here. There is no Spanish site, and the French site doesn't have the red colour, so look at the UK site or even the Nederlands site. By the way, they cost about €380 here in Denmark, new. Super on the photos, keeps me back in Amsterdam, smashing on style. We love red! We love CPH! We love bikes! you said it, Hovey Vintage.